CraftGuide: Quick access to a list of every crafting recipe in the game! To create your own, just place a crafting table in the centre of a crafting grid, put a piece of paper in each corner, and fill in the edges with four books. There is also a keybind to open it without needing an item (defaults to G), which works even if you are playing on a server that doesn't have it installed. Other useful features include small recipes as well as shapeless recipes having a visually distinct bsckground. Additionally, you can click on an item in a recipe to filter the displayed recipes so that only ones that require or produce that item will be shown (In this case, books). Use the clear button to go back to seeing them all. One of the more recent features is a searchable list of items, to quickly filter out unrelated recipes. Just right click while holding it, to see every crafting recipe in the game. -The scroll bar: Just click on the slider, and drag it up or down to quickly scroll through the list. -The up/down buttons: Quickly navigate one or ten pages at a time with the buttons above and below the scroll bar. -Keyboard shortcuts: Arrow keys, page up, page down, home, and end can all be used if you prefer a keyboard over a mouse. Up/Down arrow keys scroll one line at a time, Left/Right and Page up/Page down go by pages, and Home/End can be used to immediately jump to the start or end of the list. -Mouse wheel: If you have one, just spin it to immediately scroll the list! Number of lines scrolled can be configured to suit your preferences. -Shift: Holding shift while scrolling will multiply the movement by ten! At the end of the list, you will also find furnace recipes! Only ones that work in a regular furnace, though, and not any special furnace types added by a mod that specifically have their own separate set of recipes, unfortunately. Some items show a * over the top right corner. That means that it will accept any variation of that item (for example, wool colour or tool damage). 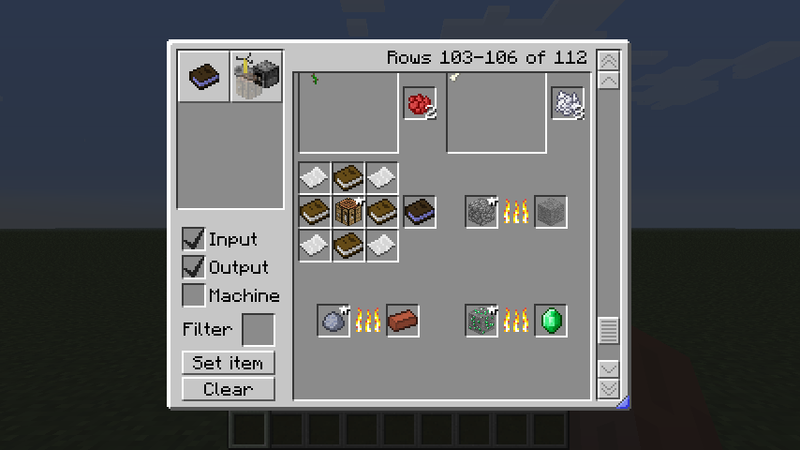 Others, with a small F in the top left, represent things in the Forge ore dictionary, which allows mods to use items like copper and tin in their crafting recipes, and have the recipes accept similar resources from *other* mods. A more technical description is that items that show the * accept anything with a specific item ID, even if the data values are different, while ones that show an F accept any specific items that different mods have declared interchangable (each of which may or may not accept any data value). At the bottom left corner, there is a small triangle. Clicking and dragging it will allow you to resize the entire GUI. This is especially useful if you have a lot of space around the edges, allowing you to see often four or more columns of recipes at once. Right now, I'm working on a fairly significant rewrite, to make it easier to set the appearance of things (anyone wanting to re-skin CraftGuide will be extremely happy), and more distant plans include adding an in-game settings menu so that anything in CraftGuide.cfg can be easily changed, without needing a text editor, or having to restart Minecraft to see the effects. Also, at some point I should really add a way to create a custom list of recipes, such as things that you often use, as a quick reference. If you don't have it yet, install either Minecraft Forge, or LiteLoader. I haven't tested it with every version, but it probably works for most of the recent ones. As of 1.6.1, CraftGuide only requires FML, which is included in Forge and also available as a standalone download. Download a CraftGuide version for whichever loader you chose. There are currently no alternate download links. Try one of the General Download Pages listed above. Yes. You may include any version of CraftGuide in any modpack. Yes. You may use CraftGuide in any videos, blog posts, screenshots, podcasts, school courses, university courses, political speeches, religious speeches, novel-length works of fiction, novel-length works of non-fiction, animated feature-length movies, and anything I failed to list earlier that you create or assist in the creation of. If you don't have it yet, install Minecraft Forge. I have only tested with 3.3.7.135 and 3.3.8.152, but I suspect it will work for everything later than *.*.*.127. Optional: Download an Extra or two! You'll probably want CraftGuide Inventory Search, if you'll be playing SMP with mods, or just don't care to craft an item and carry it with you everywhere. Optional: Download an Extra or two! You'll probably want QuickGuide, if you'll be playing SMP with mods, or just don't care to craft an item and carry it with you everywhere. Here are some optional mods that enhance the abilities of CraftGuide. Note that you already need a compatible version of CraftGuide for them to do anything (except crash, for some of them), these just add to it. This works like QuickGuide, except it has the added feature that, if you have an inventory open with your cursor over an item, pressing the CraftGuide key will open CraftGuide, automatically filtering to that item. Adds every potion brewing recipe it can find (anything that can be reached from water, with any combination of ingredients). 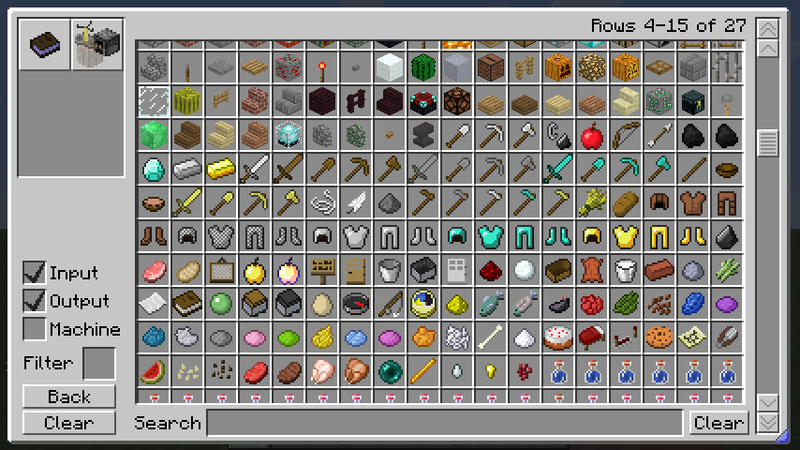 Warning: VERY thorough, it adds nearly 1000 recipes on it's own, with only the ingredients found in unmodded Minecraft! With this, you can exclude all recipes containing (a) specific item ID(s). Note: For more advanced users, as you will have to add 256 (or 2048) to item IDs, because Minecraft bumps them all up to make room for block items. First try +256, it should be the one that most people need. I'm starting to work on an API (probably misunderstanding the definition of "API", though). It isn't anywhere close to complete, so I might end up renaming anything at any time. If you don't want to include any files at all, you can use reflection to do some simple tasks. Right now, "net.minecraft.src.CraftGuide.ReflectionAPI" has a static method "public static void addFilter(Object callback)" that can be used to register an object that gets a chance to decide if each recipe should be discarded. To do so, it must have a method "public Boolean allowRecipe(ItemStack recipeItems)" or "public Boolean allowRecipe(ItemStack craftingType, ItemStack recipeItems)"
More capabilities will be added as requested or whenever I feel like it. Well, you'll need to use reflection to inform CraftGuide that your mod provides and/or filters recipes, though the API includes a class you can extend that does it for you. Using the provided class, you just extend it, implementing IRecipeProvider, IRecipeFilter, and/or IRecipeFilter2, and create an instance of your class. The base class will automatically register itself with CraftGuide (if it exists, otherwise silently do nothing), and will be called at the appropriate time(s) based on what interfaces it implements. One working example would be BrewGuide, which uses the API to add all brewing recipes (that it can find) to CraftGuide. You can get it's source here. There are probably still bugs that need to be fixed, though. A little more network code for BWR. Include recipes for the serverside BTW mod "Better With Renewables". Only shows if a config option is set or if a message from BWR is detected on connect. Added GregTech Implosion Compressor recipes. Finally added toggles for whether it searched for items in the input, output, and/or machines of a recipe. Added to the API, just a little bit. Cleaned up existing themes, removing the test ones. Added a "dark" theme. Currently the only way to use it is to edit .minecraft/config/CraftGuide/themes/currentTheme.txt, and change the text from base_texpack to dark. It is checked every time you open CraftGuide, so you don't need to restart Minecraft. Added a lot more options to themes, they can specify quite a bit more now. First official version to include the finished new API. The old API still mostly works, and so does the WIP API, so that mods that interacted with CraftGuide continue to work unmodified. New theme system, making it easier to change how CraftGuide looks without replacing the images in the .zip. At the moment, it isn't quite used for everything, yet, but that will change over time. Moved the config file, the themes/skins, and CraftGuide.log. Now all of them are placed in .minecraft/config/CraftGuide/, so that they don't clutter the rest of the minecraft directory. BrewGuide and QuickGuide functionality included in main mod. API change: Added two new classes, allowing larger (or smaller) recipes (yay, 4x4 crafting grid support! ), and a way to force CraftGuide to reload all recipes, if your mod adds, removes, or alters them during the game. experimental feature: RP2 alloy furnace recipes. The entire GUI can be resized by dragging the lower right corner. The left side is finally getting some use, with buttons to change between various views. Bugfix: output quantities weren't showing. Major rewrite of internal stuff. If you want to make a custom version of CraftGuide, use bits of its code, or just see how it works, you can find the source code on Github. If you want to use some (or all) of it in your own project, you are free to do so, though it would be nice if you mentioned CraftGuide in a text file or somewhere else where someone can find it. You can find the current source of the CraftGuide API on Github. It can be used to add, remove, or alter the recipes displayed by CraftGuide (not actually affecting crafting, just what is shown in the CraftGuide GUI). If you need help using it, or have ideas on how to improve the API, please send me a PM or some other form of communication. Yay, a way to scroll through the recipe book! Although, it is a bit expensive to make... Maybe a book with 4 ink sacs in the corners? Any possibility of having the ability to extract the recipes into a txt file? THere used to be a recipes list but it was not updated. oh I love it. The answer to my forge woes. Is there any way to set up a different book or a gui list or something for each mod? That might be asking too much I know. But doesn't hurt to ask. Risugami has already made a mod like this. He mentioned that. Yes, this does basically the same thing. But with a different interface to make it easier to get through a huge list of stuff. If, for instance, you use redpower 2 that's like 500+ pages of risugami's book. You say somebody is improving on Risugami's idea and fixing a terrible flaw we've all had to deal with before? They're even planning to update regularly? What? Are you trying to tell me that this isn't even close to being finished, and many more features are soon to come? How can it even get any better than that? I think it goes without saying that the idea is completely sold for me. It's certainly possible, but it would be outside the scope of this specific mod. Fairly simple thing to do, really. Getting recipes for the furnace looks like it should be easy. Change the mess of code I have to support the furnace too isn't. 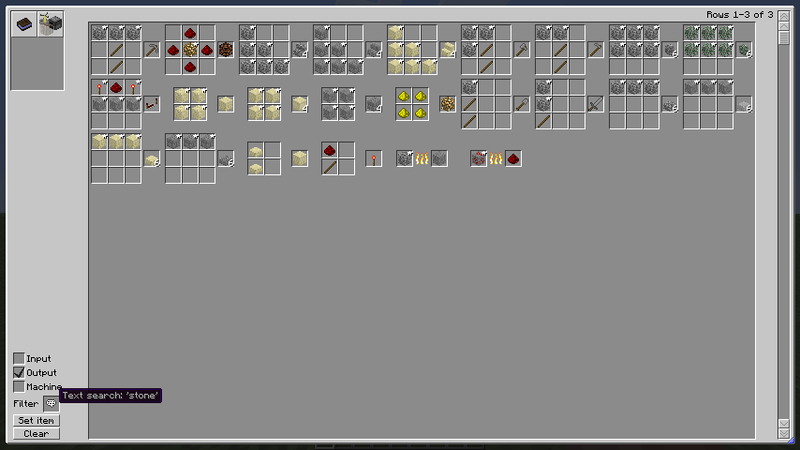 I do intend to add furnace recipes fairly soon, though. Probably going to take at least a day or two, though. Kudos for your unique ability to spontaneously generate dozens of questions in one sentence. *Why are you reading the mods forum if you can't use mods? *How did you manage to setup an account? And thank the modder for saving much of my time. EE+RP2 gives me a 750 page risu-book. This is amazing. I love it so much. I have destroyed all copies of my recipe books and replaced them with crafting guides. I don't know if it's possible to separate the recipes by mod, but it would be awesome if you could. This is still the best recipe mod ever. I might even get Infitools now. You are a godsend for many users of forge mods. No longer must I right click 300 times just to get through all of the sub-blocks in RedPower. I love the mod:) Post this in topic please? Looks awesome! I absolutely hated having to click a hundred times every time I want to see certain recipes. This will definitely replace Risu's Recipe Book, and I use the original in all my modpacks. I am going to try this mod out today. I like how it doesn't require ink, honestly. Sometimes I've found ink to be very hard to come across (without mucking with the spawn rate).